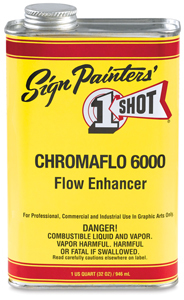 1-Shot Reducers and Enhancers are designed to thin paint, reduce viscosity, and adjust flow and leveling without significantly altering the quality of lettering enamels and bulletin colors. Low Temp Reducer improves flow and leveling at low temperatures by reducing viscosity and accelerating the evaporation process. High Temp Reducer improves application at high temperatures by slowing down the evaporation rate. 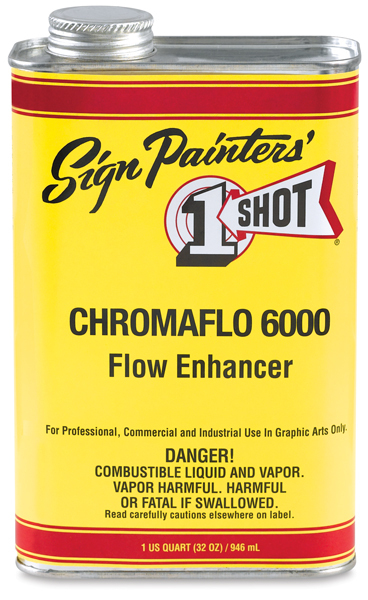 Use ChromaFlo 6000 Flow Enhancer for brush applications of lettering enamels. When used sparingly and under typical conditions, it increases brush control, decreases brush drag, and enhances flow and leveling.